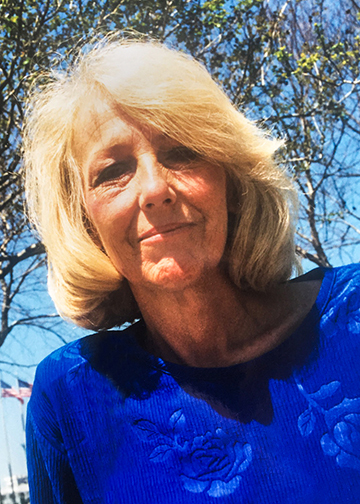 Betty Faye McDonald, 70, of Silsbee, died Friday, January 25, 2019. She was born on September 26, 1948, in San Augustine, to Mennie Belle Phelps Loggins and Martin Luther Loggins. Betty was a long-time optician for 25 Dollar Optical. Survivors include her daughter, Hollie Martin and her husband, Randy, of Silsbee; granddaughter, Michelle Martin of Minneapolis, Minnesota; and Brittany Nicole Polasek and her husband, Zac, of New Braunfels; grandsons, Jackson Dillon Simon of Dripping Springs; and Ryan Martin of Kountze; great-granddaughters, Zoey Polasek of New Braunfels; sister, Dianne Loggins Clark of Houston; sister-in-law, Kathy Loggins; nieces, Kelly Moxon of Houston; Stacy Bumstead and her husband, Gene, of Kountze; and Katlynn Loggins; nephew, Clay Erwin and his wife, Christina, of San Antonio, and Marty Loggins, and his wife, Grace; great-nieces, Casey Erwin of San Antonio and Abigail Moxon of Houston; and great-nephews, William Loggins and Jack Moxon of Houston. She is preceded in death by her parents; brothers, Martin Ray Loggins, Pete Lamar Loggins, and Jimmie “Jimbo” Lynn Loggins; and sisters, Alma Ruth Daniel and Exa Belle Nunez. A gathering of Ms. McDonald’s family and friends will be from 2:00 p.m. until 6:00 p.m., Monday, January 28, 2019, at Broussard’s, 490 Cemetery Road, Silsbee. A private family committal was held at Broussard’s Crematorium, Beaumont. I am so sorry for your loss. I loved her dearly. Im so proud to have known her and call her friend. She enriched my life and I will cherish so many great memories of this lady forever. Tho my heart is broken and I will miss her so much, I am thankful she's free of pain. Fly high Ms Betty til we meet again. Holding the family in my heart and prayers.